It is St George’s day today. Patron saint of old England. Despite the apparent rise in popularity of the day as a significant celebration in England, a survey quoted on Radio 4 this morning claimed that only one third of people in England were aware of the day, 40% did not know why St George is our patron saint and only 10% would happily fly the flag of St George. The same commentator suggested that much of what we associate with St George is in reality a Victorian invention- killed by the Howitzers of the first world war. An idea of martial muscular Christianity, allied to the service of empire. More recently, the flag of St George seems to have been associated strongly with football and the National Front. Laddish yobbishness and fascism… not something thing that I can feel any kinship or identity with whatsoever. St George killed no dragons. Neither was he English. Rather he was a thought to be a third Century roman soldier who refused to participate in the killing of Christians, resulting in his own death. He was a man who lived in the shadow of Empire, whilst following a different way of being, taught to him by Jesus. 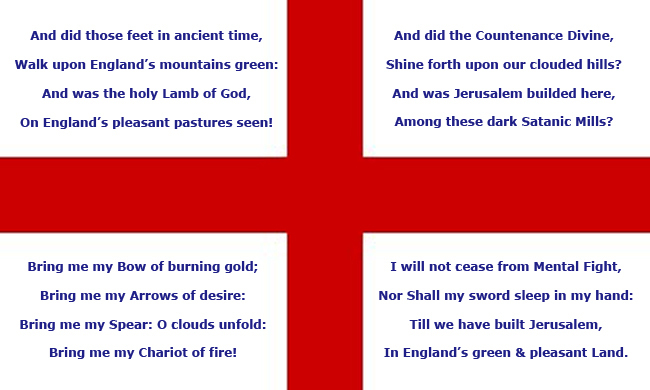 So those words of Blake written on the flag of St George above- about the building of Jerusalem in England’s green and pleasant land- or at least amidst it’s dark satanic mills- I always find them slightly ridiculous because of their association with England as Empire. But it might be possible to read the words in a different way of course. Perhaps truer to Blake’s original meanings. Because there is another England.. something deeper that is still precious to me, and so today, on the day of St George, patron saint of old Albion- I want to celebrate something English- particularly as we approach another election. 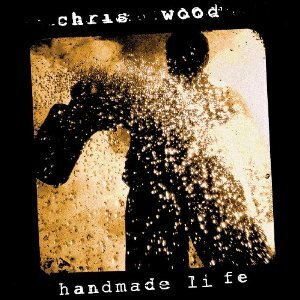 I have been listening to Chris Wood’s album Handmade Life recently. I really like it, but Michaela does not like his voice. For me, he stands in a long tradition of English folk protest singers. As a further celebration of Englishness of a kind that I can celebrate, here is one of his songs called ‘Let the Grand correction commence’. This entry was posted in Uncategorized and tagged Chris Wood, England, protest, st georges day, suffrage, william blake by Chris Goan. Bookmark the permalink.